C&S/DL Captain David E. Wilson Sr.
Word has been received of the passing of WWII veteran, Korean war veteran, and retired C&S/DL pilot Captain Dave Wilson. 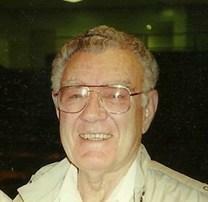 Born September 27, 1920, David Eugene Wilson was near his 92nd birthday at the time of his passing September 6, 2012. Dave had been under the care of hospice most recently. 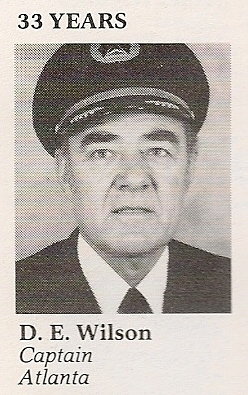 Pilot rosters indicate Captain Wilson hired on with Chicago & Southern 03-21-1950 (perhaps an adjusted date as his DeltaDigest retirement picture notes 33 years of service) and retired with Delta in 1980 at the mandatory age 60, based ATL. His good friend Jim Shannon writes “Dave flew just about everything including the 1011, was a B-25 pilot with 40 missions in Burma in the Air Force, and was a retired Lt. Col.” Visitation will be September 9th with graveside services Monday, September 17th at 2:00 pm, Memorial Oakes Cemetery, 13001 Katy Freeway, Houston TX, 281 497 2210. 12102 Steeple Way Blvd. Apt 202, Houston TX 77065-4760. Aurelia’s phone ctc is (281) 496-2818 or (281) 890-3758. David Eugene Wilson Sr., beloved husband and father, passed away peacefully on Sept. 6, 2012. Born in Eagle Mills, Arkansas on September 27, 1920, David was the son of William David and Lula Lee Wilson. He is preceded in death by his two brothers Bob and Pete and son, Stephen Lee Wilson. He is survived by his loving wife of 69 years, Aurelia Faye Wilson, son David E. Wilson Jr., daughter Debra Ann Gan, her husband Wayne, two grandsons, Doug Peters and his wife, Tiffany; Jeff Peters, and one great granddaughter, Lexi. In his early career he joined the CCC's and later the Army Air Corps, the predecessor to the Air Force. He flew as a B-25 Mitchell bomber pilot in WWII with deployments in Burma, the Caribbean Islands, Africa and the Middle East. While in Burma he received the Distinguished Flying Cross, the third highest ranked medal an aviator can receive for bravery in action. 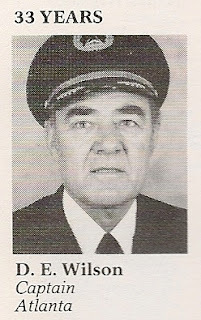 In 1947, he flew as a commercial pilot with Chicago and Southern which later merged with Delta where he continued his aviation career until retirement at age 60 as flight captain of a Lockheed 1011. He once set a speed record with Captain Joe Kelly (deceased) from Houston to New York in 2 hrs. 4 min. flying a Convair 880. He remained in active military status during his employment with Delta and served in the Korean War. Following discharge, he became a member of the Tennessee National Guard until his retirement as a Lieutenant Colonel with 24 yrs. of military service. A visitation will be held at Memorial Oaks from 4-6 PM on Sept 9, 2012. A grave site service with military recognition will be held Monday at 2 PM. Mr. and Mrs. Wilson are devoted members of Second Baptist Church. In lieu of flowers, the family requests that donations be made to Second Baptist Church – The Winning Walk. Monday, September 17, 2012, at 2:00p.m. Sunday, September 09, 2012, from 4:00p.m. - 6:00p.m.